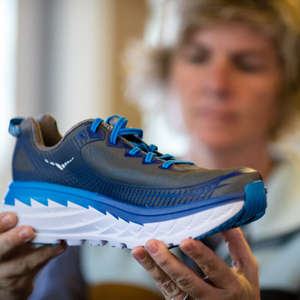 Christine Pollard has made it her mission to better understand how to help runners prevent injury and find their ideal running shoe. Christine’s fascination with footwear biomechanics began with her doctoral studies and has been renewed with dramatic changes in running shoes in the last 10 years. When she was pursuing her PhD, minimal and maximal running shoes did not exist. While maximal running shoes have been on the market since 2009, only recently have they gained traction. Christine says around 2014 there was a decline in minimal shoe sales and use, and an increased interest in maximal shoes. With their rise in popularity, Christine started asking questions. Her study, published in The Orthopedic Journal of Sports Medicine in June, is the first research publication to evaluate maximal running shoes. Christine and JJ Hannigan, a post-doctoral researcher, enlisted 15 runners from central Oregon to participate in the study conducted at OSU-Cascades’ Functional Orthopedic Research Center of Excellence (FORCE) Lab. Christine and JJ wanted to determine if the extra cushioning in maximal shoes decreased the force in which runners strike the ground. As 90 percent of runners in the United States are heel strikers (their heel strikes the ground first), all participants were screened for this running style. To evaluate the difference between the Hoka One One, the first maximal shoe to market, and traditional shoes, each runner ran a 5K in new Hoka Bondi 4 shoes and in traditional shoes a few days later. None of the runners had previously run in a Hoka shoe. The researchers now want to determine if runners strike harder because of the extra cushioning or if the results were indeed related to more cushioning. These questions are leading them into their next study. With the FORCE Lab, Christine is determined to better understand how footwear influences running biomechanics and how to help prevent lower extremity injury. In addition to the follow-up Hoka study, she has two related studies underway.